This is a 1998 Baker book from a well-known theologian and author. Erickson admits that this is not his final word on the subject and that such a response is coming in the near future. This is a review of six leading writers on postmodernism, ranging from David Wells who adamantly opposes postmodernism as a useful Christian tool, to B. Keith Putt who advocates Evangelicalism becoming more postmodern on purpose. 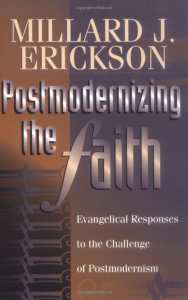 Erickson does do an introduction and a conclusion in which he, more often than not, warns believers of obvious postmodern dangers. This is not a long book like many on the subject, I think it is a good place to start reading.